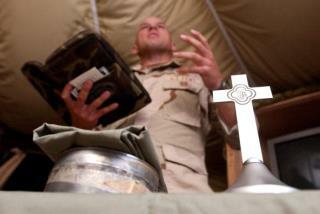 US Army Evangelism: Is It a 'Crusade'? (Newser) – US Army chaplains have distributed Arabic-language Bibles in Iraq, told soldiers to "hunt people for Jesus," and speculated that President Obama is a secret Muslim. Enough already, says a religious rights watchdog: Led by Air Force veteran Mikey Weinstein, the group is suing the Pentagon over alleged religious-based practices and chaplains who "see the military as a mission field with a lot of low-hanging fruit," Weinstein said. The suit alleges that top chaplain and fiery sermonizer Jim Ammerman, 83, runs a chaplaincy that violates Pentagon rules, eschewing interfaith cooperation and linking with supremacist causes, Kathryn Joyce writes in Newsweek. But Ammerman's lawyer says the Constitution protects him, and so far, the Pentagon agrees. Meanwhile, critics say, America's fastest-growing denominations—evangelical and Pentecostal—have long driven mainstream Christian belief from the US Army. Thanks Fondue. Agnostic means to accept the UNKNOWN and there are things UNKNOWABLE. I have been leaning agnostic for years. My personal philosophy is this: One can't prove Santa Clause exists no more than one can prove Santa Clause doesn't exist. To anchower: Does one "choose" what one believes? I do not believe that the god, Jupiter exists. I have no choice about that. I might be coerced into professing a belief in Jupiter, but I wouldn't really believe.